One of my favorite parts of a wedding day are the preparations...when the bride and her bridesmaids are getting ready for the big day ahead. I always arrive early for this special time, capturing lots of candid moments of the bride’s makeup being done, her hair styling being finished, the little flower girls and junior bridesmaids being dressed. Sometimes the little ones seem almost as excited as the bride herself. While the bride is getting dressed I’ll be taking pictures of all of the little details that will be a part of her day...bouquets of flowers, shoes, jewelry, the garter, the wedding invitation, the wedding rings, etc. Everyone is anticipating the big moment...when the bride steps out in her wedding gown for everyone to see. This can be an emotional moment for the bride’s parents, family and friends and it is very satisfying as a wedding photographer to capture the reactions of her loved ones when she appears in her wedding dress for the first time. This photograph was taken just before that big moment. 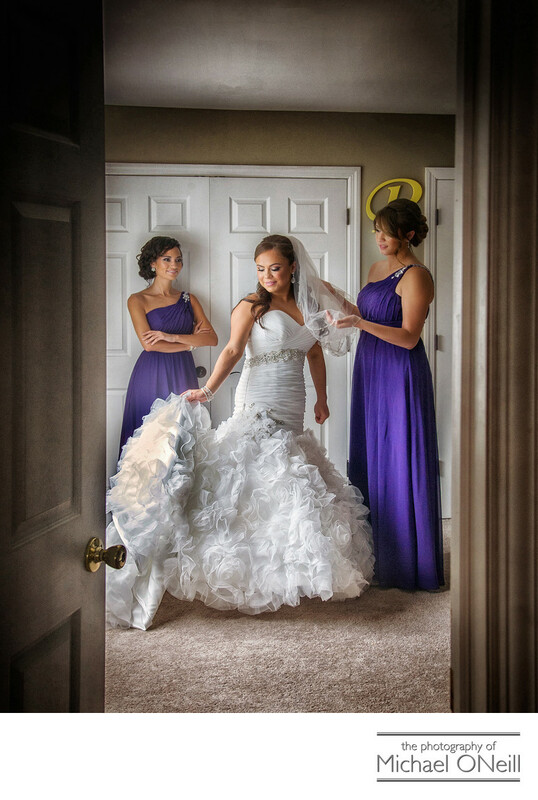 The bride had finished dressing and was making some last minute adjustments with two of her bridal attendants. Natural light was flowing through a window in the bride’s bedroom and was casting a beautiful light on the bride’s face. Her gown was lit perfectly, showing off all of the detail in her amazing dress. I positioned myself just outside the door to the bedroom, leaving the edge of the door and the doorknob in the picture, giving the image the feel of being seen by someone who just happened upon this tender scene. Soon after this precious moment the bride’s father would see his little girl in her wedding gown and we would capture all the emotion of that moment along with some beautiful portraits of the bride, her maid of honor, her matron of honor, her bridesmaids, her adorable little flower girl and her proud parents. Then it would be off to the ceremony where her groom would see the bride for the first time as she walked down the aisle of church. So much joy. So much happiness. So much anticipation. So many different emotions all based in love.